In the small town of Moss Hill, customers of all kinds visit Carissa Shea's Seelie Tree Apothecary Shop. That includes tall and short, young and old, human and faerie. Being half-elf/half-human herself, Carissa personally knows and cares for them all. So, when a grumpy brownie, a type of house faerie, named Miss Morgan dies in her shop, Carissa is devastated. As she learns more about her customer's death, she realizes Miss Morgan might have been the only thing standing between the Seelie, faeries of light and goodness, and the Unseelie, faeries of darkness and evil. On top of it all, the Sidhe guard, protector of all fae residents, rule it a murder and name Carissa as a suspect! Now she must prove her innocence and find the real culprit before it's too late - not just for her but for all of Moss Hill. Q: Astoria, tell us about your series. Is this book a standalone, or do readers need to read the series in order? A: The books can be read in any order because each has its own story and conclusion. I tried not to give any spoilers to the previous endings in later books. There is an overall storyline that is better understood if read in order and is best enjoyed starting with the prequel to the last book. I’m currently on book 4 of 7 planned for the series. A: Arizona. So, it might seem weird that I’m writing about an island in the UK, but I am fascinated by mythology from around the world. I hope I have a chance to write about many other places and to travel as well. A: I can’t even imagine this, how great would that be? I’d love to save up for a big trip and go somewhere like a writers’ retreat. A: My worst purchase was a pair of shoes I knew didn’t fit right, but I thought I would break them in. I’m lucky I didn’t break a toe, but I learned my lesson. Blisters hurt. A: Is it terrible that I don’t think I’ve ever done anything daring? Oh, publishing! That was daring, I think. A: When I used to complain about being bored as a child, my father used to always say, “If you have a good imagination, you’ll never be bored.” So, I learned to use my imagination by reading, writing, and wondering about anything and everything. I credit that statement for my sometimes overactive imagination. A: My most treasured items are Christmas tree ornaments from students, friends, and family. It makes the tree more meaningful to me, and I get to reminisce every year when it comes time to decorate the tree. By the time I’m an old woman, I hope every ornament is a story – even if those stories only matter to me. A: In terms of objects, I’d save my computer. My whole life and my manuscripts are on there! A: Chocolate. But then, it’s usually followed by a migraine, so is it really worth it? Honestly, it depends on the chocolate. That line stuck with me because it reminds me not to judge others. We don’t know what others are going through, and we don’t really know each other inside and out. If we did, I believe this quote would be true. A: I wish! Well, no, I don’t wish any faeries would be murdered. I do wish there was a town of elves, leprechauns, brownies, sidhe, etc. I would so live there! Unfortunately, Moss Hill doesn’t exist. Then again there are myths and legends about faeries all through history and in several countries. Who knows? Maybe there is such a town. A: Any of the characters in my book would probably do it with a spell directly at me or sneakily slip a potion into my tea. A: Orson Scott Card, J.K. Rowling, and JRR Tolkein all make the shortlist. These are writers who are capable of creating worlds and/or characters unlike what we see in everyday life. Kate DiCamillo is one of my favorite children’s book authors. I was introduced to her books as an adult when I started teaching at an elementary school, and the books were as impactful to me as they were to my students – if not more! Last, but not least, I also admire Agatha Christie, who is, of course, the best mystery writer of all time. Q: What book are you currently reading and in what format (e-book/paperback/hardcover)? A: I’m usually listening to an audiobook and reading an ebook at the same time. For the last few days I’ve been listening to Neverwhere by Neil Gaiman and reading The Curious Kilt by Jemima Wallace as an ebook. A: I write anywhere in the house, but I have an office room with a desk and a drawing board on the wall. I prefer that or outside in the back yard. A: It’s in Connecticut and it’s called The Walker Library of the History of Human Imagination. I’ve never seen it in person, it’s privately owned, but how awesome does it look? I first saw it on a TED Talk and thought it looked remarkable. A: Either Donna Noble from Doctor Who in the episode “Midnight,” where she spends the day at a spa on a planet made of diamonds or Guinan from Star Trek spending the day in Ten Forward talking to all the different people of the future. A: It would be a library of rare books and artifacts much like The Walker Library of the History of Human Imagination. A: My parents owned their own business (a restaurant). From them I learned that making a living can be in your own hands. I’m trying to learn everything about publishing, writing, etc. so that I can start a business and work for myself – even if it’s not as an author but in some other aspect of the publishing industry. A: Yes! I’ve learned a lot and entertained people with my stories. It’s been amazing so far! Q: What steps to publication did you personally do, and what did you hire someone to do? Is there anyone you’d recommend for a particular service? A: I did the writing, of course. I also published on KDP and through Smashwords myself. I hired an amazing artist for the cover art. She also did my logo. I also hired a map designer recently to make a map of Moss Hill. I had a wonderful editor for the line editing, Tiffany Shand. I just started working with a company called 529 Books for developmental and line editing. I recommend any and all of them since they’ve all been wonderful! 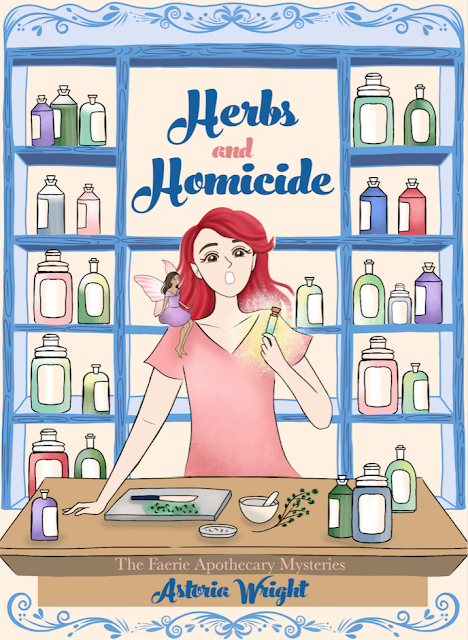 A: I am continuing on with the series The Faerie Apothecary Mysteries. I also write some science fiction and hope to get a few sci-fi novels out this year. 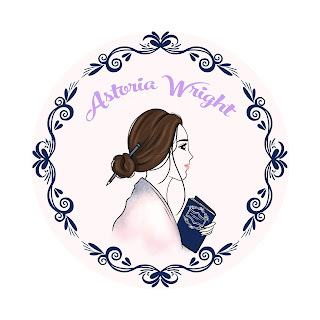 Astoria Wright is a cozy mystery author and a poet who is inspired by rainy days, good books, and positive people. Often found sitting by a window or in her backyard sipping tea or coffee and writing or reading cozy mysteries, Astoria tends to be a bit reclusive. Still, when the topic is stories, she's more than happy to join the conversation. Join her mailing list at www.astoriawright.com to see stories, poems, and thoughts that she only shares there.